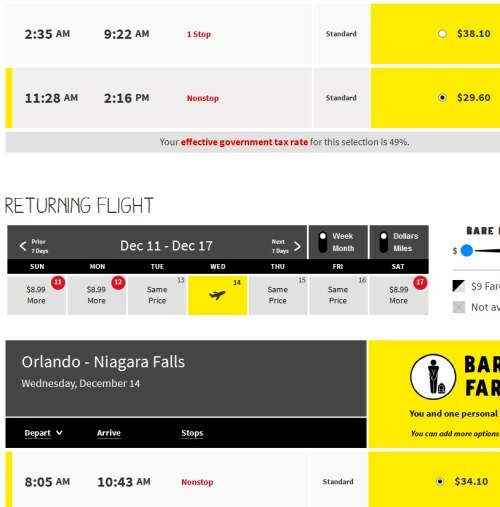 Spirit Airlines is showing flights from Niagara Falls, NY (IAG) to Orlando, Florida (MCO) for $86 CAD roundtrip including taxes. You may want to read more about flying out of Niagara Falls (IAG) in the following article: The Official Guide For Canadians Flying Out Of U.S. Airports (from Toronto & area). You could combine this airfare with the '25% off DisneyWorld multi-day theme park passes for Canadians' offer from Disney that's been available for a few weeks now. The total price should come up as $64 USD, which will work out to $86 CAD when charged to a Canadian credit card, based on today's exchange rate and including the typical 2.5% foreign currency exchange fee. Dates have been added to the list below. Update 10/28 - Quite a few more dates have been released for November/December 2016 and January/February 2017. I've added them to the list directly below. Feb 13, 14, 21, 22, 23, 26, 27, 28 -- new! Mar 1, 2, 4, 5, 6, 7 -- new! Feb 15, 16, 17, 21, 22, 23 -- new! Mar 1, 2, 3, 7, 8 -- new! The total price should come up as $64 USD, which will work out to $85 CAD when charged to a Canadian credit card, based on today's exchange rate and including the typical 2.5% foreign currency exchange fee. Update 1/11 - Dates in the second half of February and early March have now become available. Available dates have been added to the list above. flight deals, united states, florida, niagara falls, iag, spirit airlines, north america and orlando mco.